A recent Nottingham Skeptics event featured a fascinating talk by Hazel Gibson. The talk was entitled "Living on frack-tured Earth" and looked at Hazel's research into the public perception of geology - or, more specifically, hydraulic fracturing (fracking). Hazel began by pointing out that while she was a geologist (and had, for example, worked on a drilling rig), she was not an expert on the technicalities or politics of fracking. Instead, her research looked at the public understanding of geology. The talk was in four main sections, a brief introduction to fracking and then a focus on the viewpoints of scientists, activists and affected local communities respectively. Hazel outlined the fracking process, with a schematic not unlike the one below and described how it involves injecting a high pressure liquid (usually water based) into a drilling well in order to fracture the surrounding rock. Particles in the water enter the cracks and prevent them from sealing up again when the pressure is released. Fracking is generally performed at depths far below that water table. A key, relatively recent, technology has been the development to accurately drill horizontally along a rock seam (which may run for hundreds of metres, if not kilometres) rather than just into it (which only allows access to a relatively small area of rock. Hazel also passed around a sample of shale and explained that the pores in the rock that contained oil (or gas) were tiny - just a few microns in size. Hazel described the geologists view of fracking as it being a technology which could be used for a number of purposes, including geothermal energy extraction. Hazel did not discuss the latter, feeling that this was a political question that applied to all fossil fuels and was not specific to shale fracking. Regarding groundwater contamination, Hazel touched on the US phenomena of methane leakage into groundwater (see this video for example) and pointed out that methane in water is not a new phenomena, as evidenced by the number of places called "Burning Springs". Hazel also offered the possibility that the drilling companies may have been attracted to the area by the high methane levels in the water, rather than the methane being caused by the drilling. Hazel stated that baseline monitoring of methane levels was key to ensuring clarity about how methane levels in tapwater do or don't change after drilling starts. Hazel also stated that drilling companies put additives such as Guar Gum, Polyacrylamide, Sodium Chloride. Formic Acid. Methanol and Napthalene into their drilling mixtures. While these chemicals are well known and widely used in conventional industry, their behaviour when used in drilling operations is not so well characterised, especially in terms of their behaviour in combination. Hazel also offered up a few of the more extreme stunts pulled activists, suggesting that perhaps activists weren't like the rest of us - which led on nicely to the fourth part of the talk. Hazel spent some time on this subject, starting by saying that she felt it was unfair to label people who were challenging drilling their locality as "NIMBYS" as it was a good thing that they were caring about their environment and communities. All reasonable challenges to make for someone who cares about their locality. Hazel also perceived that the public would perceive the word "earthquake" to mean a significant disturbance that could cause structural damage to buildings - whereas in fact the tremors associated with fracking are very small and often unnoticeable. Hazel also noticed that the general public who did not have any local drilling occurring (or planned) would describe fracking using references from the media whereas, in contrast, those who lives local to drill sites became much less trusting of the mainstream media and authority in general, so looked to alternative sources of information. Another aspect of public understanding that Hazel encountered was that of parents being educated by their children, with the phrase "my kid told me" being made as the parent explained some fact that their child had learnt at school. Hazel was deeply respectful of the expert local knowledge that communities had, which she felt was just as important as the "expert" knowledge held by drilling companies and geologists. Given that Hazels talk was about public perception, it is no surprise that she did not cover many of the issues surrounding gas fracking. But, inevitably, the talk has caused NSB to do some digging and below are some of the items that caught NSB's attention. Properly titled Hydraulic Fracturing, fracking is a process that has been around in some form for several decades. However, it has been the key developments of massive hydraulic fracturing (1970s) and horizontal drilling (1980s) that allowed the large scale extraction of gas locked in some shale formations. These recent technologies, incidentally, was perfected by US oilman George Mitchell, who seems to have been quite an interesting character. NSB certainly found it useful to have a look at some simple animations of how fracking works, for example this by National Geographic and this by Marathon Oil. "The ad, published in February, said Britain suffered a "near-catastrophic gas shortage" in early 2013 and claimed that extracting natural gas from shale rock would mean: "decades worth of natural gas", "millions of pounds in tax revenues", "freedom from interruptions and stoppages as a result of Russia's political games with your gas supply", "lowering energy prices for millions" and "reducing greenhouse emissions by replacing coal with natural gas for energy". A reader complained to the ASA that the claims were misleading because they exaggerated the extent of Britain's gas shortage, the supposed benefits of fracking were not known, and Russia did not supply gas to the UK. The ASA ruled against Breitling on all counts. It told the company it must not make its claims again and that future ads should be supported by hard evidence." In a longer version of the "burning water" video mentioned earlier, the householder describes how the methane levels in her tapwater at the time of drilling were 0.01mg/litre and that these increased later, over a short period of time, to 56mg/litre - a level that is far above safe limits. More on the need for baseline monitoring here. 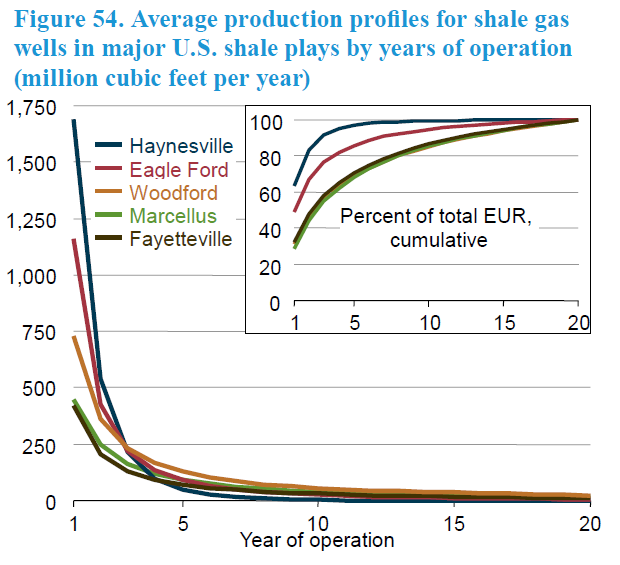 According to Wikipedia (yes, I know, but life is short) the economics of shale gas extraction are marginal, a view echoed in this industry article. Much of the drilling industry's PR talks about wells giving gas for "20-40 years". But what they do not seem to mention is that production falls off dramatically over time. However, this is no different to ordinary oil wells. 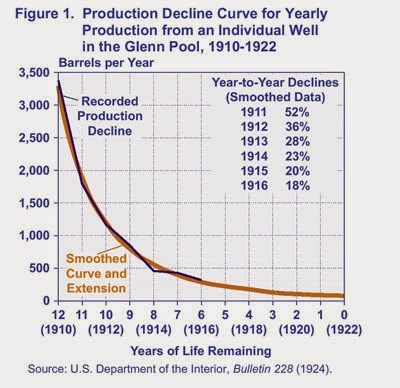 Below are typical decline curves for oil and shale gas wells, and here is a explanation of decline curves from a geological engineer. Fracking operation require a lot of water to be used in a short space of time, easily a million (US) gallons per drill. Often this water has to be transported to the drill site in dozens of tankers. In addition, the water will return to the surface in a contaminated form, and will either need to be cleaned, or used on other fracking operations. More on water use in this NY Times article. 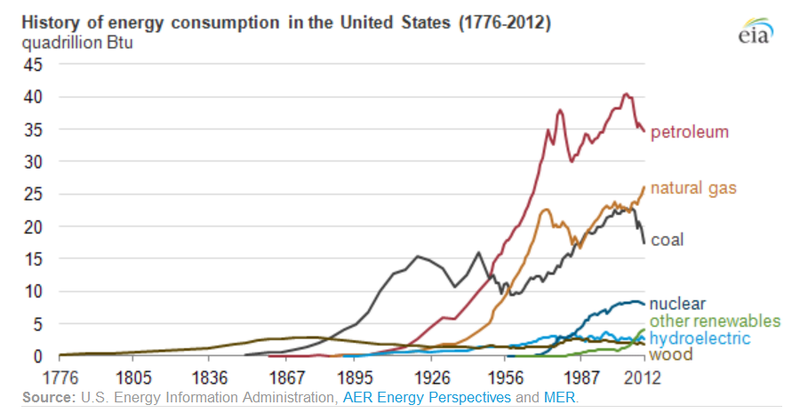 US Government data shows that, per unit of energy, Gas CO2 emissions are 50% of coal and 68% of oil. 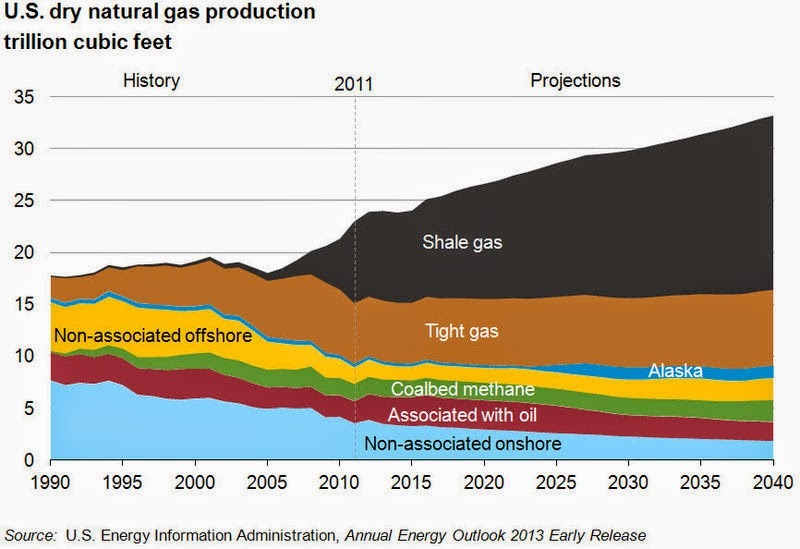 Shale gas generation has become a significant part of US gas production. Added a few more links and also wanted to mention that information about the use of fracking in hydrothermal power generation can be found here and here. How long is a packet of Spaghetti?